I don’t mean greenback we are so familiar with, not directly anyway. Startups and more mature companies are developing clean energy technologies that help reduce the use of fossil fuels and carbon emissions and increase energy supplies and independence. Companies around the world are embracing environmental responsibility as a core business strategy and undertaking sustainability initiatives that encourage greater stewardship of the planet. Southern California Edison plans to spend about $875 million to cover two square miles of rooftops, which will generate enough electricity to power more than 150,000 homes. By some estimates, solar capacity will increase 30-35% a year between now and 2020, by which time solar energy will account for almost 3% of global electricity output. A deal was struck in the beginning of the new year to sell the world’s largest wind turbine to Queen Elizabeth II.When it’s completed in 2010, the turbine will produce 7.5 megawatts of power all on its own. That’s roughly 1.5 megawatts more than today’s largest turbine. Kawasaki, Washington Mutual, Optimal Health, and other big and small companies have joined a green marketing coalition that aims to address the environmental impact of junk mail. Last month the University of Tennessee announced an energy conservation policy that will save $2 million annually, an amount equal to the salary of its football coach. 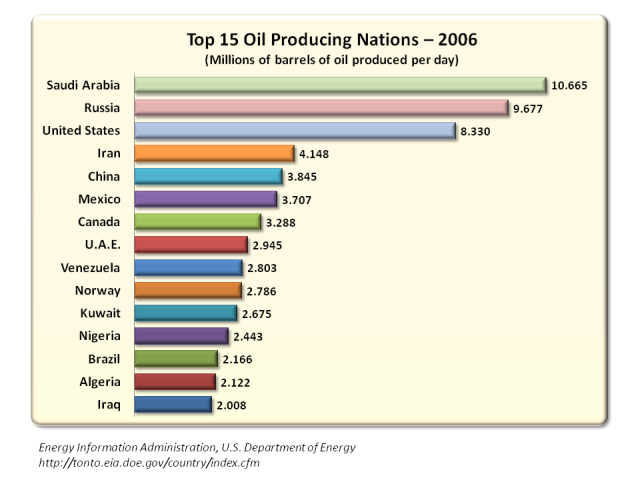 Of the 15 largest oil-producing nations in the world, the number of those in the Middle East is only 4 – Saudi Arabia, U.A.E, Kuwait and Iraq, not counting Iran, Nigeria and Algeria. The last three are not Middle Eastern countries per say. By one estimate, building the necessary infrastructure throughout California to charge electric cars would cost $1.5 billion, an amount equal to two weeks of oil imports. In November, 2008, California officials unveiled plans to turn San Francisco into electric car capital. In 2007, the United States was the leading global consumer of oil, accounting for 23.9% of world consumption. China was second consuming 9.3%. Between these two countries, the total consumption of oil comes to 33.2%. In the very near future, alternative energy will not put a big dent in oil consumption, but we gotta start somewhere. Initial investment will be large compared to any return, but that’s what happens in any industry. Today’s energy and environmental concerns are creating unlimited opportunities to solve what is considered to be the greatest challenge of our lifetime: preventing the costly, far-reaching and permanent effects of global climate change.